Earnings are up, but so too are worries over trade. 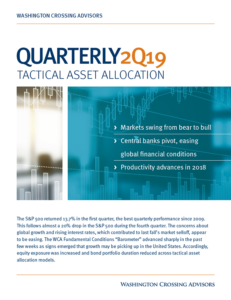 We discuss this year’s changing market, and tactical adjustments WCA has made in CONQUEST and Dynamic Strategies portfolios. Most of the surge in profit forecasts can be directly linked to last year’s tax cut. Profit forecasts for the S&P 500 jumped right after passage of President Trump’s Tax Cuts and Jobs Act (TCJA). The TCJA reduced the corporate income tax rate to 21% from 35%, instantly adding a ~20% tax “bump” to S&P 500 after-tax profit forecasts (blue line in graph). Some better economic growth expectations also gave sales forecasts a modest lift, too (green line in graph). Rising forecasts provided all that was needed to put a bid under the stock market through much of 2017 and into 2018. This momentum has since faded, however, as investors wonder what comes next and grow more cautious amid growing trade tension. For the TCJA to have a sustained impact over time, it must lead to a sustained increase in productive capital investment. A lighter tax on capital, we reason, would improve the return on such investment, provided entrepreneurs and risk takers maintain a reasonably bright view of the future. A higher rate of capital formation would be a very welcome development for driving growth and returns, after many years of below trend capital formation. Without an improvement in the rate of capital investment and growth, the TCJA’s future will be in jeopardy. While we do not see an unwinnable and global “trade war” as the probable outcome, it is a plausible risk that we should consider. This is part of our “risk case” as it has the potential to dampen confidence, and darken the outlook for global investment and growth. Businesses are less likely to make productive long-term investments given the sort of uncertainties that would invariably accompany an escalating and protracted trade dispute. Such an outcome would almost certainly have a significant negative impact on the global expansion, with widespread negative consequences for growth and no clear winner. We are again reminded that we live in a globally connected world, where global growth is important. China and emerging markets, for example, which have been important engines of global growth in recent decades, have begun to show some signs of weakening. In recent weeks, China’s stock market has fallen into a bear market (-20%), emerging market (EM) bonds are showing signs of stress, and EM currencies are under pressure versus the dollar. China has been taking actions to stimulate more lending by cutting bank reserve requirements and tempering some of the actions it had been taking to reign in speculation and its “shadow” banking system. 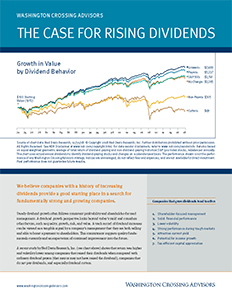 It is yet to be seen whether these actions will have their desired effect by boosting growth. If they do boost growth we should see a pickup in activity later this year. The good case from here envisions a firming of global growth as trade fears fade through the second half of the year. This would be viewed as a positive by markets, and we would expect to see a firming of risk appetite, a fall in volatility, and a pickup in global growth. On the other hand, a further rise in trade tension could create uncertainty, dampen risk appetite across markets, and dampen growth by injuring global capital investment. Until we get clearer signals that risk appetite and capital investment is not threatened by mounting trade tension, we are inclined to assume more cautious short-term tactical posture. For more on recent tactical changes tied to our WCA Fundamental Conditions Barometer click here and here.